Investing in BB (bee-bee) sized solar granular polysilicon. On January 8, 2010, “President Obama Awards $2.3 Billion for New Clean-Tech Manufacturing Jobs” announced the awards for ARRA (American Recovery and Reinvestment Act of 2009) Advanced Energy Manufacturing Tax Credits for one hundred eighty three (183) projects in forty-three (43) states including AE Polysilicon Corporation in Pennsylvania. announced its subsidiary, AE Polysilicon Corporation, has been awarded a tax credit of US$44.85 million for Phase I under section 48C of the IRS Tax Code by the U.S. Department of Energy (DOE). “This is a great news for us and it will provide an incredible return on investment once we are in production.” said York Tsuo, President of AE Polysilicon Corporation. To enjoy the tax benefit, AE must reach its goal of producing 180 metric tons of poly-Si and make a profit in 2010, Motech CFO & spokesman Norman Shen explained. AE already began trial production earlier this month and will kick off volume production later in the first quarter of 2010, Shen indicated. The 180 MT required by the tax credit represents a little more than one month of full production. Since AE Polysilicon: Final Plan Approved way back in 2008, Phase 1 appears to have been upgraded to 1800 MT (Metric Tons) from 1500 MT. Back then, an AE Polysilicon agent claimed “they’d like to have the facility up and operating and producing product before the end of 2008.” Given the track record of delays, it is hard to believe AE Polysilicon’s schedules until they are achieved. 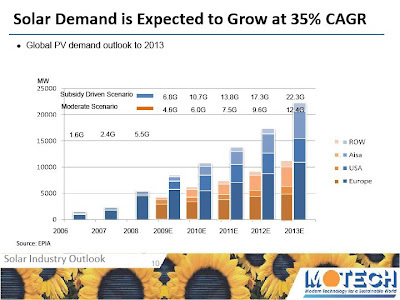 “AE Polysilicon has high hopes” by John Anastasi for The Intelligencer had the updated schedule last year. 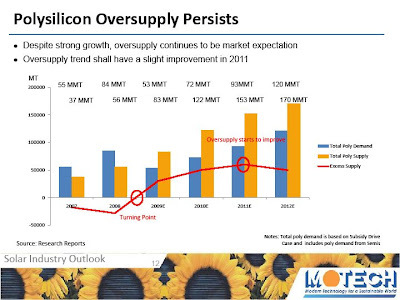 At the Motech 2009 Q3 Investor Conference, Motech CFO Norman Shen presented “Solar Demand is Expected to Grow at 35% CAGR” while “Polysilicon Oversupply Persists” although noting the “oversupply trend shall have a slight improvement in 2011”. 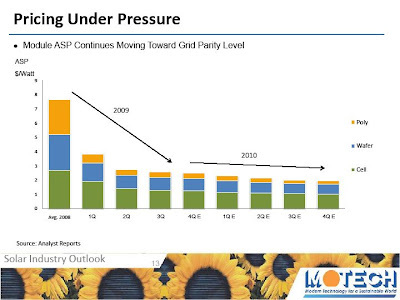 However, Motech believes the “Pricing Under Pressure” trend will continue as module prices move towards Grid parity though at a slower rate in 2010. AE Polysilicon is participating in the KIPC’s sustainability partnership with the EPA as shown in this September 23, 2009, KIPC-TV video. Don’t forget about “TSMC buys into Motech” by Mark Osborne at PV-tech.org when Taiwan Semiconductor Mfg. Co. Ltd. (NYSE:TSM) purchased a 20% stake in Motech for about $193 Million back in December 2009. Is AE Polysilicon indirectly TSMC’s first capital investment in the United States? Actually, TSMC was one of the original investors, and the technology transfer partner, for WaferTech, a foundry fab in Camas, WA built in 1997. Subsequently TSMC achived sole ownership I believe. The fab is still operational with a capactiy of 25 – 30k wafer starts/month. So it is not accurate to say that AE Polysilicon is TSMC’s first capital investment in the US, although it may be their first capital investment in the US in the solar industry. Did the Plant close? I heard they laid everyone off? ?